I continue to visit one particular take out restaurant with over a dozen locations in Oahu and locations on almost every island; for one item. Their teri burger is a winnah ! I love this recipe with all the flavors built in, no sauce required. 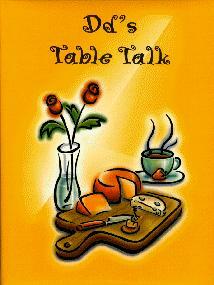 Order DD's Table Talk Cookbooks - Didi is one of the primary contributors to this site, if you love the recipes, you will love her cookbooks which is where many of the recipes come from. She has worked as some of the top restaurant and caterers in Hawaii. In a mixing bowl; combine all ingredients well. Shape into desired sized patties. Broil of pan fry until cooked to doneness. Serves 3-4.